When you are an avid RV enthusiast, winterizing your RV can be one of the saddest times of the year. But hopefully your enthusiasm is strong enough to prepare your RV properly, in order to beat Old Man Winter and prevent him from doing damage. 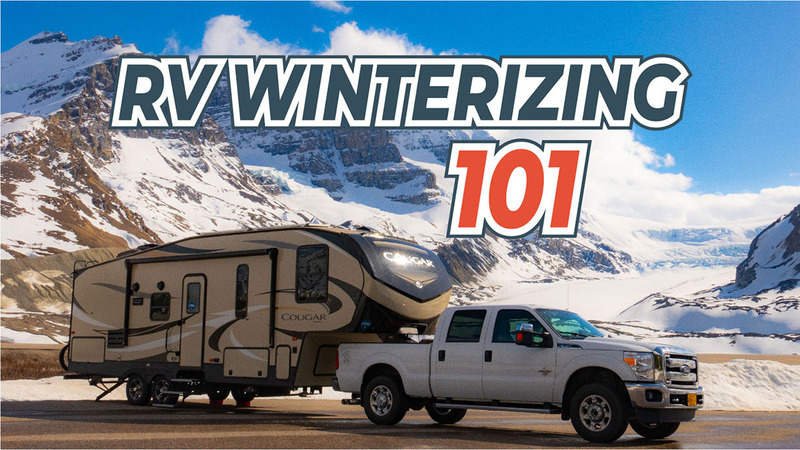 RV winterizing can be avoided by heading to warmer climates for the season, which I personally highly recommend! 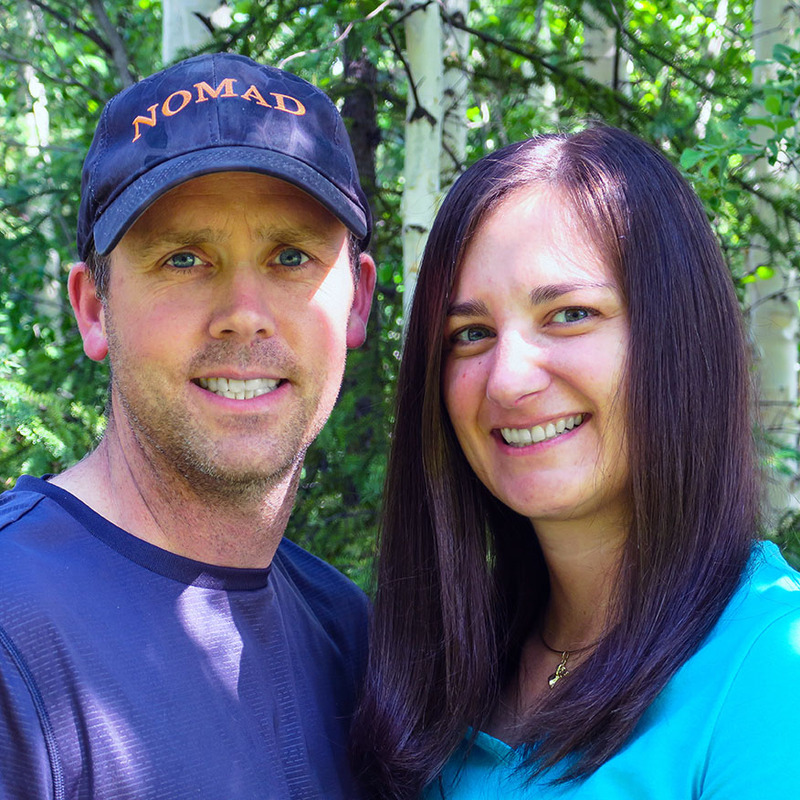 However, the reality is that most RV owners find themselves in need of winterizing at one point or another. Even if you’re a full-time RVer, you may find the need to winterize if you’re having an extended stay with family for the holidays, traveling across the country late in the season, or even camping in winter climates where you can’t keep your components from freezing. Water lines are usually the first thing that comes to mind when people think about winterizing an RV. It’s true, water left in your system can do some real damage when it freezes, yet there are a lot of other things to be looked at during the process, as outlined in this article. If you fail to winterize, the penalty can be costly. Just the water heater alone in an RV can cost more than $1,000 to replace if it freezes and cracks. Winterizing your RV is not just to prevent damage from cold weather. 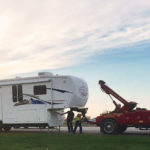 Any RV that sits unused for a long period of time is susceptible to damage, even in warmer climates. Any time an RV will be parked, and unused for an extended period of time – it should be winterized. Any reputable RV service center can perform the duties of winterizing your RV water system. While the cost usually starts around $90, it can easily rise to over $200 if you have a washing machine, dishwasher, or an ice maker in your freezer. But there will still be items for you to handle on your own. If you choose to make winterizing a DIY project, you could have as little as $10 and an hour of your time into the same functions that will be provided at the service center. 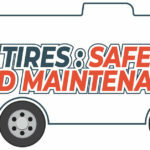 Keep in mind that those costs double if you take the RV back to the service department to have the winterizing process reversed and the unit prepared for your summer adventures. When water turns to ice, it expands by 10%. That 10% expansion can result in cracked lines, valves, and a non-repairable water heater. You have to get the water out of the lines, and there are two common practices to do just that. First, for either practice, you need to drain all the water out of the water heater. 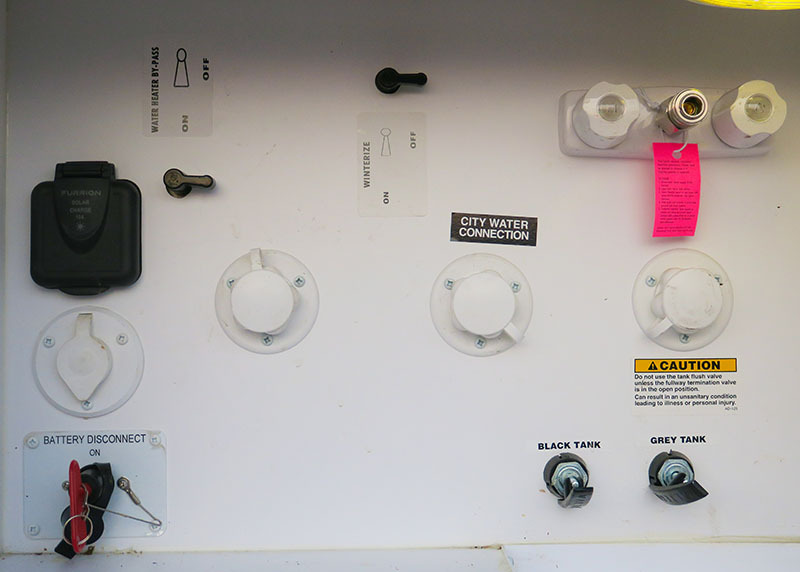 Make sure the switch is off for the electric side of the water heater. The electric element will burn out if there is no water in the tank and it is accidentally turned on. If you have an inline water filter, either remove it or bypass it during the winterizing process. It may be a good idea to change that filter in the spring when you get your RV ready for use. On the water heater, run the hot water until there is no hot water left, then remove the lower plug with a 1” socket with extension. This plug generally is part of your anode rod, which is a consumable product and needs to be inspected every year or more frequently depending on use, and replaced as needed. Note: not all water heaters have anode rods. Keep this in mind when you prepare your RV for summer use. After draining, reinstall the plug-in order to pressurize the tank. Don’t worry about using thread tape or compound, since you will need to remove the anode rod again to make sure no water was introduced into the tank. Pump non-toxic RV antifreeze through all the water lines. In order to do so, you will need to pump the antifreeze through your water pump, and also through your city water inlet. You will need a hose to attach to the water pump and a hand pump to attach to the city water inlet in order to get the antifreeze through the system. Make sure you bypass your water heater so you don’t waste 6 gallons of antifreeze. Do NOT use engine antifreeze. 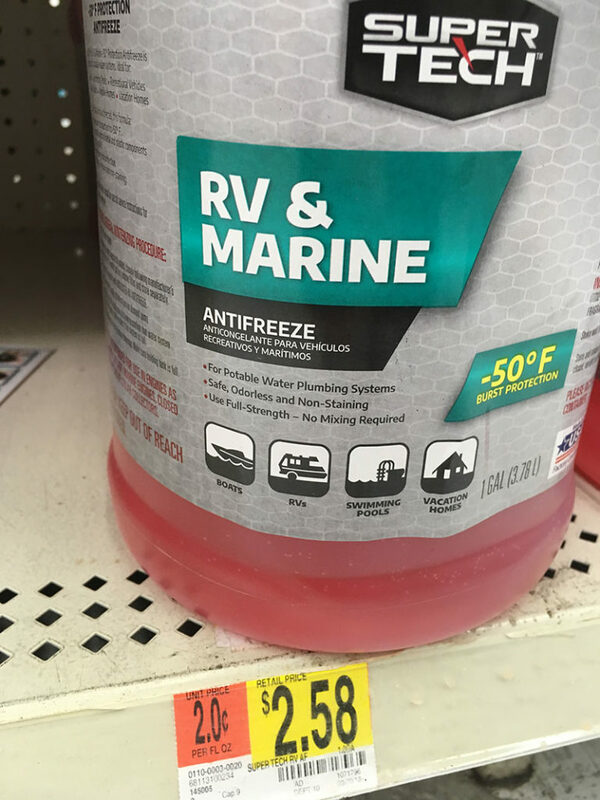 The RV antifreeze product is pink and is specifically formulated for your RV water system. Pump the antifreeze through until each water line is clear of water and is completely replaced by the antifreeze. Do not forget the outdoor shower, outdoor kitchen, and black tank flush, if your RV came equipped. Pump air through all the water lines. 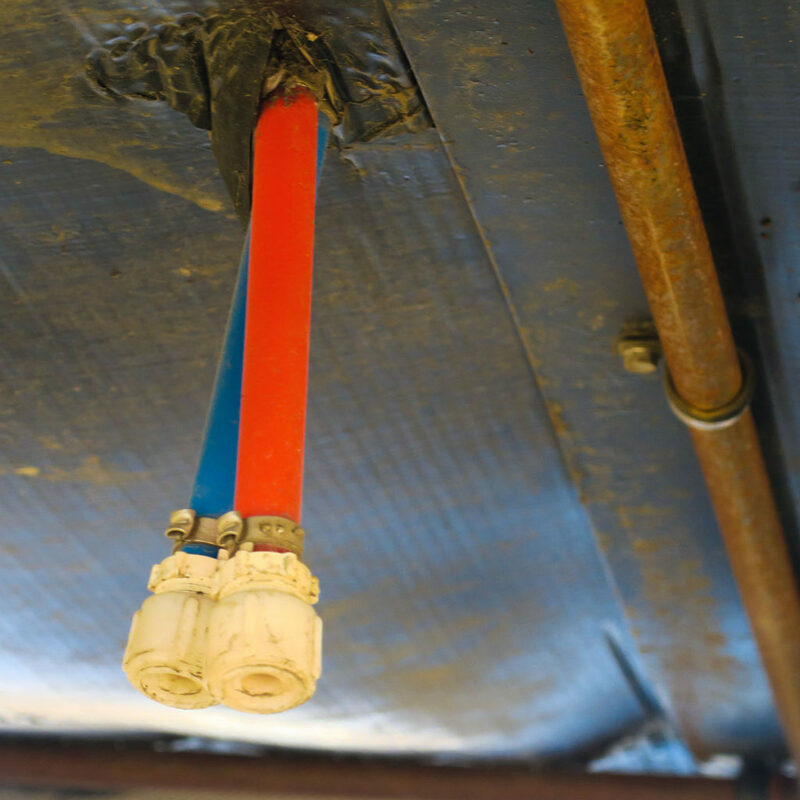 In order to do this, attach a blowout plug to your city water inlet where you can then connect your air compressor. Then you can use the compressor to blow air, pushing the water out of the lines. Keep in mind that most RVs are rated for no more than 50-60 psi of pressure, so keep your air pressure below 50 psi while performing this task. Your water heater is most likely 6 gallons, so it will take a while to fill up before allowing you to open up your valves to allow the water to be pushed out. Open the valves on all of your faucets (kitchen sink(s), bathroom sink, indoor & outdoor showers) hot and cold sides, until air is the only thing coming out. There is still a chance of water being trapped in the water pump. Therefore, it’s recommended to either store the water pump in a warm location or pump a small amount of antifreeze through it. Dump all holding tanks as you normally would. Then flush the black tank thoroughly with a wand. 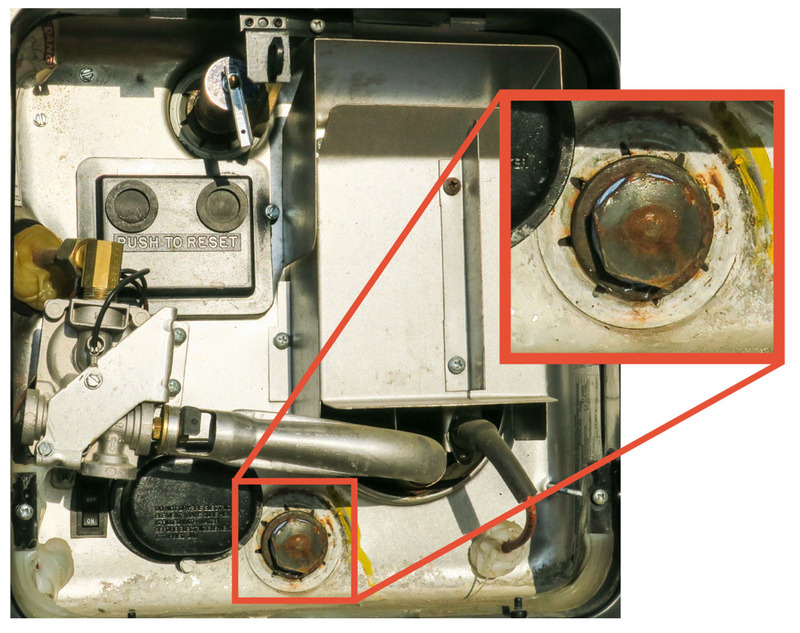 Some RVs come equipped with a black water tank flush, which can be used instead of a wand. Remove all low point drain plugs and store in a safe place for winter. Be mindful of the water level in your fresh tank, which can take a long time to drain and that it doesn’t flood the area it’s draining to. Pour antifreeze into the drains. At a minimum it should be enough to fill the p-traps where water usually sits. You will need to do the same with the toilet. Empty the refrigerator of all food and drink. If your fridge is equipped with an ice maker, consult your manufacture’s literature to see how to remove all water from the system. Otherwise turn off the power and defrost your fridge and freezer, making sure water does not leak on the floor. Be sure to do the same with an outdoor fridge, if you have one. After defrosting, it’s a good idea to give the inside a good wipe down. Keep the doors partially open during its storage period, there are handle clips that can be purchased at an RV store to do just that. Like the refrigerator, all cabinets should also be emptied of food and liquids. While they may store just fine and not go bad, it’s not worth the risk of attracting insects and rodents who could do great damage to your RV. Make sure that the water hoses you use to fill your tanks or hook up to city water are drained and stored in a clean area. A battery that is not fully charged has the potential of freezing and splitting. A battery that has discharged by more than 50% will lose much of its useful life. If you cannot keep a trickle charge on the battery while it sits outside, then remove the batteries and store them in a warm area. Either way, make sure to disconnect the batteries so they won’t discharge quickly, and only disconnect and store them after you have fully charged them. 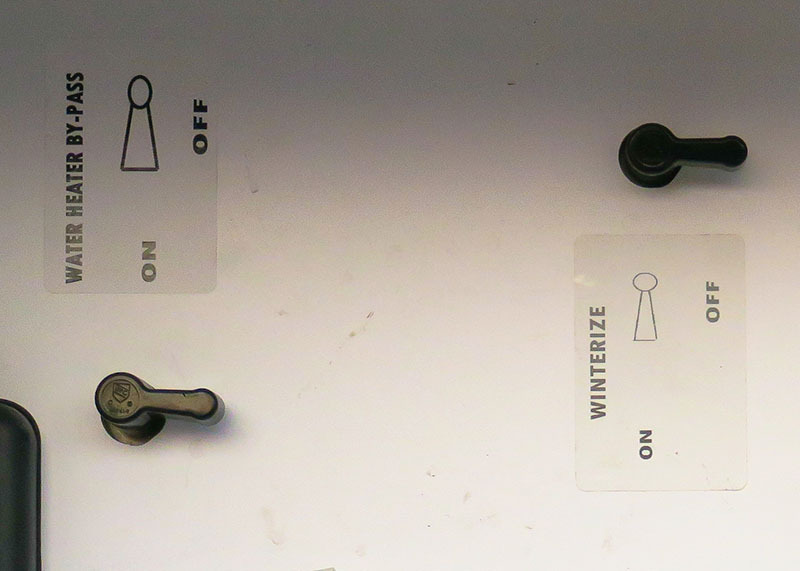 All roof vents should be closed so that melting snow cannot enter the RV. Keep in mind that heavy snow loads can cause serious and expensive damage. While you may choose to put a cover on your RV, any large amounts of snow should be removed. You can also store your RV under a shelter that will keep snow from collecting on the roof. Local storage facilities rent out covered spaces for RVs and RV shelters can be purchased for as little as $1,100. Heavy snow loads are not just hard on your roof, but also on your axles. Snow loads can increase your total weight over the suspension capacity. On average, 1” of snow weighs one-pound per square foot. Therefore, if your roof is 8’ wide and 30’ long, just 1” of snow will add 240 pounds of weight. It would only take one snowfall of 12” to add almost 3,000 pounds. Use caution when clearing snow off the roof. Instead of using a shovel, push the snow off with a 24” broom, to reduce the risk of damages. Along with disconnecting the house battery, you should also remove all batteries that are in electronic devices such as remote controls and smoke detectors. Leave the lids off, so that you remember to install fresh batteries once you put your RV back in service. Remove all linens and clothing so that they do not become damp from humidity or become living quarters for rodents and mold. This includes bed linens, blankets, pillows, kitchen towels, rags, bathroom towels, washcloths, and personal clothing items. Use the opportunity to wash, repair or replace as needed for a fresh feel when you head back out on the road. Take precautions against mice that may enter your RV for a safe haven from winter. Seal off all entry points that were missed by your manufacturer, install deterrents such as peppermint extract so they won’t want to come in, and set up traps for those that do decide to have a house party. Clean your RV from top to bottom on the outside. Any road grime on the frame or exterior walls can cause erosion depending on its structure, so don’t let that erosion continue all winter long. This is a good time to inspect the roof, walls, and seams while your cleaning. Repair any spots that could cause potential leaks or further damage. Clean the interior – floors, inside cabinets, and counters of course. But don’t forget the window sills, door jams, and kitchen appliances too. All tires should be filled to the manufacturer’s recommended pressure. Use tire covers or sheets of wood to block the tires from the sun’s UV rays to help prevent rot. Park with your tires on solid ground, possibly on top of pieces of wood in order to keep your tires from sinking in the ground, which can make it difficult to move when taking it out of storage. In addition to disconnecting or removing the starter battery, there are a few more cautions that need to be taken. Make sure the engine antifreeze is rated for your climate so your engine block and components don’t split during a deep freeze. A premix engine coolant (antifreeze) of 50/50 will have a freeze point near -50°F. You can easily test your own coolant temperature rating with an inexpensive refractometer, available at almost any chain auto parts stores. Place Sta-bil fuel stabilizer at the correct ratio for expected time stored, and the amount of fuel in the tank. Keep in mind that Sta-bil is formulated in two different blends, one for gas and one for diesel. Using the fuel shut off switch, run the generator out of fuel. Place gas stabilizer in any remaining fuel if you do not remove it completely. This will keep the carburetor from clogging up during storage, which will make for a time-consuming DIY repair or a costly visit to your mechanic. Your RV is an investment, it’s your home, and it needs to be taken care of. Knowing how to winterize it yourself will teach you more about the components in case you have any problems down the road. If you do choose to have an RV tech winterize the water system for you, don’t forget about the tasks that are not included in the service. The owner’s manual can be a great supplement for the particulars of your system, and you can also find DIY videos on YouTube for the step by step process of winterizing your water system.